CHOICE #1: The DIY Cheap Way Out. You might decide to go to the local drug store and get yourself some strong toothache medication to feel better for a while. Unfortunately, we all know what happens next. This remedy won’t last too long and chances are that you will end up losing your tooth and/or experiencing the misery of a tooth abscess. ….OR you might decide to see what a dentist can do to help. Chances are that our good dentist will recommend a root canal. It goes without saying that none of us particularly enjoys the prospect of needle sticks and gruesome drilling in the dentist’s office. We can expect, though, to save our tooth and get a crown on it. Bottom line: the pain is gone, the tooth is saved and we are happy again. That’s more like it!! Let’s go back to coronary disease! A lot more than a tooth is at stake but a great deal of patients are still in denial and will try any easy way out rather than facing their condition. Some patients are unsuccessfully treated with medical therapy and/or stents and show up again with the same or more chest pain, shortness of breath, profound weakness or even worse…a heart attack and/or a much weaker heart. In many cases, these same patients subject themselves to a radical, often exaggerated decrease in their physical and social activity to avoid their symptoms of chest pain, palpitations or shortness of breath. Some others get more and more stents in spite of the fact that they are obviously not working for them. I recall the extreme example of a 58-year old coronary patient with multiple stents saying, and I quote: “I’m fine. I only get chest pain when I walk! !” I heard once this line: “Insanity is doing the same thing over and over again, expecting a different outcome each time”. All coronary bypass patients should be strongly encouraged to consult with a heart surgeon and get a balanced view of their options in the treatment of their disease. The avoidance of necessary bypass surgery can eventually cause a bigger problem and effectively take your quality of life away. I am always amazed by how little information is offered to patients and their families when they are “shopping” for their best options. You should always feel free to ask as many questions as you like to your primary care physician and to the heart specialist about your choices in treatment. Our low-impact and minimally invasive techniques in coronary bypass surgery have dramatically improved our results and have shortened the recovery time. The overwhelming majority of coronary patients in my service return to their homes two-three days after their surgery. Even frail and older patients can enjoy these excellent results and their permanent fix. What is a Coronary Artery Bypass? 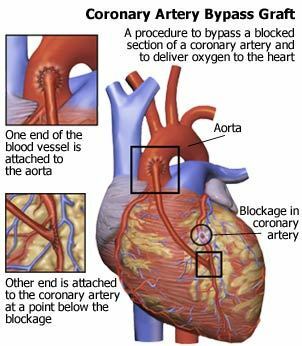 Coronary bypass surgery is one of the most frequently performed surgical procedures in the U.S.. To put it in plain plumbing terms, this procedure deals with badly clogged pipes (the coronary arteries). We connect a new pipe (a bypass) between the aorta (the equivalent of the main water supply) and the coronary artery segment downstream from the blockage (the “clogged pipe”). This bypass serves the purpose of bringing back a normal flow of oxygenated blood to the portion of heart muscle supplied by the blocked coronary artery (see picture below). The traditional way to perform this operation involved the use of a heart-lung machine and a midline incision through the breast bone (median sternotomy). With minimally invasive coronary artery bypass surgery, we are now able to perform a coronary artery bypass while the heart is beating, with no need for a heart-lung machine. In expert hands, this technique allows excellent results and a shorter and less complicated postoperative course, especially in the older and higher risk patient population. By avoiding the use of the heart-lung machine, we are also able to perform a much less invasive procedure. Clinical studies are beginning to show that this technique is associated to much less bleeding and very few patients require transfusions. It is better tolerated by the lungs and kidneys, which is a great advantage in patients with emphysema and/or renal insufficiency. It might also be beneficial in patients that have carotid artery disease (bad circulation to the brain). For all these reasons, it is my personal preference to use this technique in the overwhelming majority of my coronary patients. The operation is carried out by connecting the aorta to a small opening in the segment of coronary artery beyond the blockage. The connection is created with saphenous veins harvested from the leg, internal mammary arteries from the chest wall, radial arteries from the forearm or other arteries from the abdomen. The first coronary artery bypasses were performed only with leg veins. In the 70’s the internal mammary artery (IMA) was introduced in clinical practice. It was soon discovered that the routine use of this artery for bypass can guarantee long term results that are far superior to using only leg veins. Numerous clinical studies have in fact shown that even after 10 years over 96% of the IMA grafts are still open and function well. The use of the IMA to bypass the coronary artery that feeds the front of the heart has been proven to give our patients the greatest survival advantage over any other intervention in contemporary medicine. This the reason why the left IMA is now considered the graft of first choice all over the world, often in association with other grafts if more than one bypass is necessary. The excellent results we observed with the use of the IMA lead us to believe that the preferential use of more arterial grafts instead of veins might improve the duration and quality of the beneficial effects of the bypass operation. In addition to both IMA’s (right and left), other arterial grafts such as the radial arteries from the forearm, the right gastroepiploic artery from the stomach, the inferior epigastric artery from the abdominal wall, etc. have been successfully used. It is again important to point out that every patient gets an individual evaluation to decide which particular procedure and grafts suit him or her best. The minimally invasive coronary artery bypass procedures are known with the names of MIDCAB and MICS-CABG. I will describe them separately to show you how we were able to evolve and improve on these modern surgical options. This technique represented the first breakthrough in the field of minimally invasive coronary surgery. It is carried out through a small chest incision and does not require the use of the heart-lung machine. This operation is performed on the beating heart and instead of the traditional big midline incision, a 2″ to 3″ long transverse incision is all that is necessary to access the heart. In this female patient the incision is right on the skin fold underneath the left breast to insure an invisible scar (see picture below). 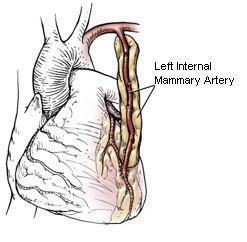 The Left Internal Mammary Artery (it’s the blood vessel hanging from the two silk stitches) is harvested from the chest wall and prepared for connection to the blocked coronary in the front of the heart. 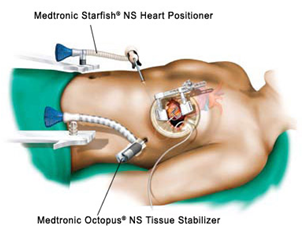 A mechanical stabilizer (that two-pronged fork) is used to immobilize the portion of the heart surface where the blocked coronary vessel is and allow the surgeon to connect the left internal mammary artery to it. The wound is then closed with plastic surgery techniques and the scar will be effectively hidden in the skin fold underneath the left breast. This approach can basically afford most of our patients a scarless and often painless operation. After this minimally invasive operation, our patients experience minimal pain with a small surgical scar and can often go home within the next 48 hours with a left internal mammary artery graft. Once again, this mammary graft is by far the best life insurance that modern medicine can offer to coronary patients!!! Ask your cardiologist about it. It is important to remember, though, that each patient needs to get an individual evaluation by the heart surgeon in order to decide if he or she is a suitable candidate for this procedure. The MICS CABG operation represents the best contemporary minimally invasive option for patients who need multiple coronary bypasses. As I discussed in the previous paragraphs, the MIDCAB operation allowed many patients that needed a bypass to the Left Anterior Descending Coronary Artery (LAD) the opportunity to get an excellent minimally invasive option. Its limitation, though, is that it could not be applied to the vast majority of coronary patients who also needed bypass grafting of the circumflex and the right coronary artery branches. MICS-CABG is the acronym for Minimally Invasive Coronary Surgery – Coronary Artery Bypass Grafting. This procedure has been designed to allow the same grafting strategies of traditional breast bone splitting operations through a minithoracotomy incision. The big technical challenges were to figure out a safe and reproducible way to attach the vein and/or arterial grafts directly to the aorta and then expose coronary artery branches that were not easily reached through a minithoracotomy incision. This is the most advanced technique currently available to carry out a complete multiple bypass operation through a small chest incision. This dramatic technical evolution has been made possible by the joint effort of dedicated minimally invasive surgeons and new surgical technologies developed specifically for these operations. The drawing below shows you the set up of some of these new instruments that allow a triple or even quadruple bypass operation without splitting the breast bone. The chest incision is about 2″ in length and does not break any bone. Most patients recover rapidly and are able to return to their homes and families within two to three days. Click on the image below to watch a video of a MICS CABG operation. It is a step-by step description of how I perform this procedure and will help you visualize its technical implications better than any picture. Keep in mind that the necessary expertise in these techniques is not available in many parts of the country. Very few surgeons had the extensive training and experience to deliver a reliable MICS-CABG but we are all committed to teaching our colleagues interested in learning these minimally invasive CABG techniques. Hopefully these surgical options will soon be available in every state. We are seeing a growing number of out-of-state patients in my center who request a consultation for a minimally invasive coronary artery bypass surgery. Better informed patients are doing their “homework” and want a less invasive coronary option. Call our office at (330) 588-4676 or contact us online to schedule an appointment with Dr. Ciuffo to discuss your minimally invasive coronary artery bypass surgery options. Click on the image below to view a video of a new operation I designed to treat an otherwise inoperable patient with coronary artery disease and a porcelain aorta (complete calcification of the aorta). This technical solution is possible thanks to the use of beating heart surgery techniques and a creative use of grafting options. It made all the difference for an inoperable coronary patient who would otherwise have no options left.